Home>Oils and lubricants>Lubrication and greasing>Oils and fats>Multi-functional grease>Fat food Molykote G-4500 spray 400 ml. 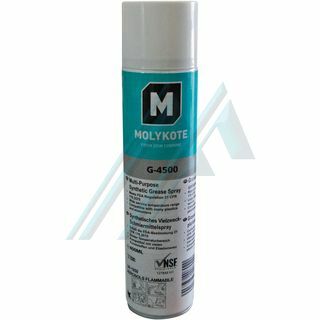 Fat food Molykote G-4500 spray 400 ml. Special lubricant that combines the advantages of the range of working temperatures and compatibility with various materials. Lubricant long lasting for assembly and maintenance, can be used in applications of food manufacturing including mixers, motors, conveyors, equipment in low temperature, packaging and many other applications in or out of the industry of food processing, where it is a desirable fat white colour. Such applications may include furniture, instrumentation, photo and optical equipment. Features: multipurpose Applications, wide temperature range service, great support, meets the list of requirements of regulation 21 CFR 178.3570 of the FDA yestá registered at NSF under H1 category for incidental contact with food. Composition: Polyalphaolefin, the thickener aluminium complex, solid lubricants.